Australia have received a huge blow ahead of the Tri-Nations and the World Cup with the news star prop Benn Robinson has been ruled out. 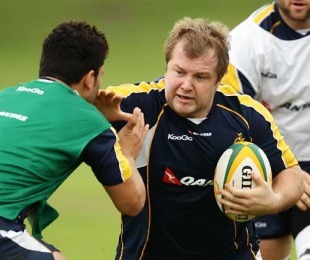 Scans have revealed the Waratahs prop has suffered a torn anterior cruciate ligament in training on Tuesday. The 26-year-old hobbled from the field in obvious discomfort after hearing a "click" in his right knee during an opposed drill at Coogee Oval. Medical staff were initially confident the injury was only minor, but the world-class loosehead prop faces up to nine months on the sidelines after scans confirmed a torn cruciate ligament as well as meniscus damage in the joint. "It's disappointing news for Benn, disappointing news for the rest of the squad and for Australian rugby as a whole," Australia coach Robbie Deans said. "No-one likes to see injuries like this. The seemingly innocuous circumstances in which it occurred only adds to the frustration, but injuries have always been a part of the game. "When the door closes for one player, it opens for another and I'm sure the other front rowers we have will step up to fill the void Benn leaves. As far as Benn goes, we wish him all the best for his recovery and will be providing him with any assistance he needs." Australia have not named a substitute prop for Sunday's game against Samoa though it is expected that either Western Force prop Pek Cowan or the Waratahs' Al Baxter will come into the 22-man squad. Both players trained with the team on Wednesday as coach Deans assessed his options in the front row.